This is an archive page and is no longer updated. These notes were written by the founder of the project, Lou Brown (now a busy new mum), to guide those wishing to start a scheme in their area. Step 1: Advertise in your local area to recruit garden owners - posters, announcements, press releases, etc. Step 2: Interview the garden owners on the phone, or go and meet them to get a clear idea of their needs. Take photos of the garden if you have the time. Have a thorough conversation talking through all the necessary questions about motivation, expectations, access, privacy, harvest share, times, days, etc. – you need a thorough form for this that you fill in for each. (You are welcome to use the ones on the TTT website – see below). Make it very clear the way you are running the scheme, and that they are agreeing to offer a portion of their garden for a grower to grow on. Our gardeners share a proportion (we recommend 1/4 - 1/5) of the produce. Be clear about boundaries and that the gardener is not sadly available to trim hedges and roses and do general upkeep, as that is not the remit of the scheme. This must be clearly stated - as you need to protect your gardeners from false expectations. Step 3: Start recruiting Gardeners – posters, announcements, press releases, etc. Step 4: Get all gardeners to make an appointment to come in to see you. If they flunk the appointment be aware of their possible flakiness and use your discretion. Go through a detailed set of questions (see our forms) to tease out their motivations, experience, expectations, and commitment. Use your integrity and intuition to make sure that you feel you would be able to recommend them to a garden owner (this is a serious responsibility). Be clear that you are the third party for both primary parties to contact in the case of any concerns that arise - but that the gardening commitment is a serious one, and will run to them working on the garden at least 3 times a week in the growing season, as well as respecting the boundaries agreed with the garden owner at the outset. If you want to have your gardeners sign up to a scheme of public liability insurance mention this too, and give them the paperwork to fill in and return to you when they have been matched. Give multiple copies of any agreements or certificates you are using (see website) to sign with the garden owner when they meet (get them to send you one copy, and keep one for themselves), as well as risk assessments, etc (if that is your thing). Step 5: Try and match the gardener with a garden local to them as possible. Check that their expectations and intentions for the scheme match. Do their schedules match? (A weekend gardener can't be paired with an owner who wants the garden to be private on Sundays.) Step 6: I phone the garden owner and tell them all about the gardener and give them some idea of their situation and needs, and who to expect a call from, and ask if I can give their number to Jilly or Jim, or whoever. Step 6: I give the gardener the garden owners number and they arrange to meet (occasionally I might go and introduce them if it the garden owner might be considered vulnerable in some way). Step 7: Call to see how it all went, and then give them a call from time to time to see how it is all going for them. Step 8: Give both parties a call and then at the end of each season send out feedback forms to hear how each gardenshare is working. 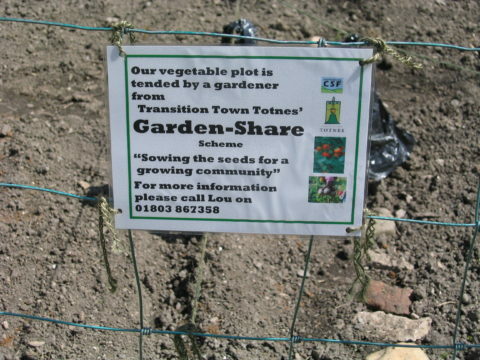 Some gardenshare schemes make their gardeners take out public liability policies, or run CRB checks. In the spirit of trust, the Totnes scheme consciously chose to do neither of these. 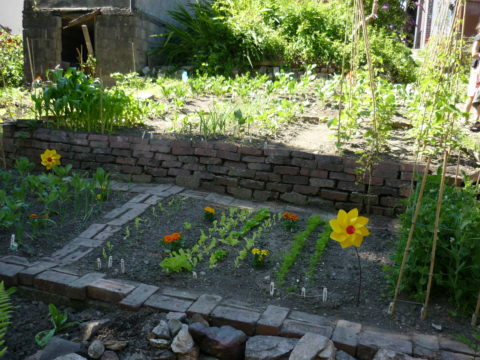 This was because it became increasingly difficult to make people pay to do this when they were firm friends in their 4th year of gardensharing. Regarding safety my feeling is that it is important to use one’s intuition, and if I couldn't seriously recommend a gardener to someone, I simply wouldn't. Again, I think that building up a sense of trust within a small community like ours is a huge part of the project, and if I was up to mischief, I really wouldn't sign up to a local project, give all my details and masquerade a knowledgeable gardener...It just wouldn't make sense. Meanwhile TTT started having a very comprehensive public liability insurance and this covers all our activities now, including our gardensharing activities. What are the hidden downsides and difficulties? All I can say is that the experience has been profoundly positive and there have honestly been no drawbacks. All the gardeners and the many garden owners have worked and shared their spaces with respect and commitment. Sure, there have been a couple of gardeners who haven't put in the work and have been disappointed, but inexperience and lack of time has been the worst of it - and these cases are astonishingly rare! The idea is a very basic one, and humans are so good at cooperating and working together beautifully as long as everyone knows what to expect. The most surprising thing for many people who've phoned to ask about how to run it smoothly, is that there have been no bad surprises. People don't tend to take advantage of each other when they are working together on this kind of project - it's about sharing, community, and a bit of hard work. I find that seeing how people cooperate like this and how happy it makes them to do so really inspires me to believe in our potential for community living. These resources are temporarily unavailable.